I loved journaling when I was in high school! In fact, it was something I tried to do every night when I was in high school! It happens to be some of my favorite reading now, as an adult. My kids think it's pretty hilarious too, to read back to the days when mom had teenage emotional struggles, major crushes on boys, etc. Maybe if kids now days, could get their emotions out in a more productive way, less of the BAD STUFF that's been happening in the world, would be happening. Maybe? Maybe it could help some at least, get their feelings on paper and open up to what is causing their hurt, struggles or even their joys! 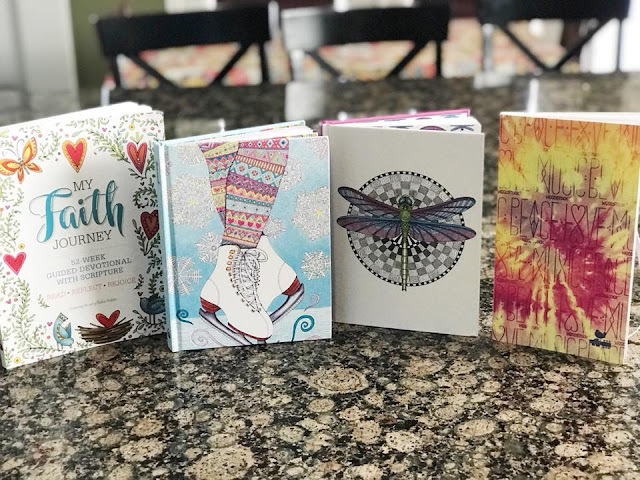 Fox Chapel Publishing sent us an assortment of their Journals to check out! All of these journals are high quality and range from blank pages to journals with topics to write about...for those days when you need a little inspiration. 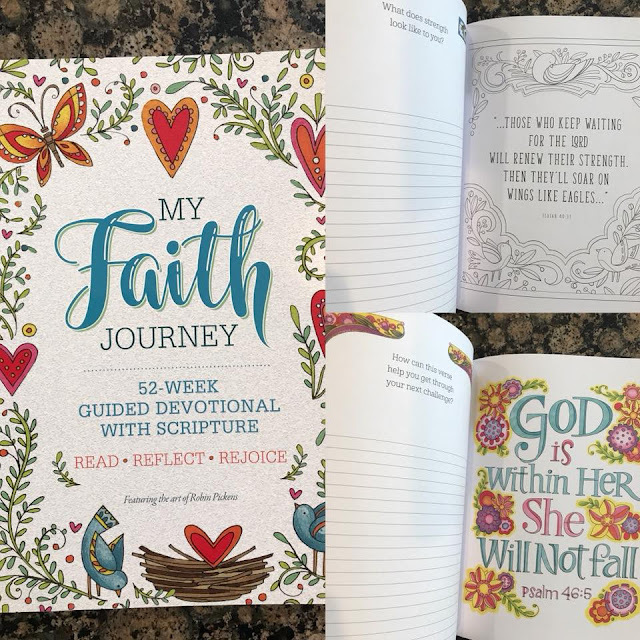 Pictured above, "MY FAITH JOURNEY" journal! 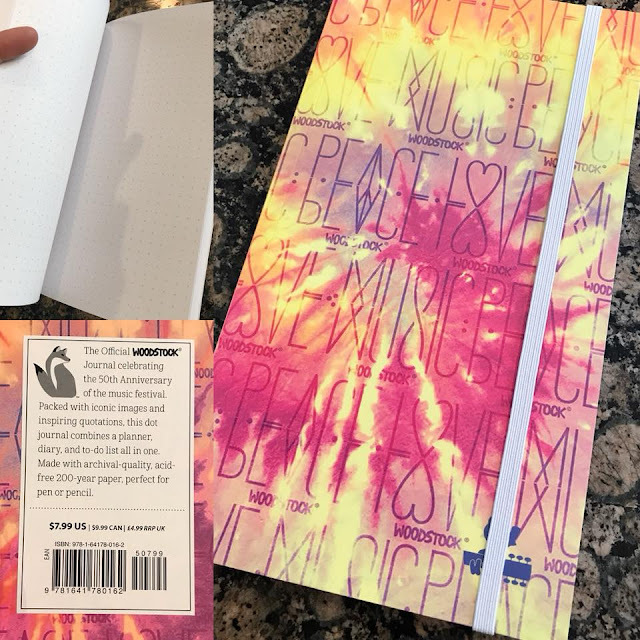 This journal provides not only a topic to write about, but on some pages, offers you a creative space to color and doodle. I LOVE THIS for me! Having a strong FAITH, this type of journal is a great way for me to stay connected to topics I should be reflecting on daily. It's also a great way for me to write down my MAJOR praises! There have been a few victories in the past few years...that's for sure and it's nice to be able to keep track of them on paper, maybe even for my GRANDKIDS to read about! 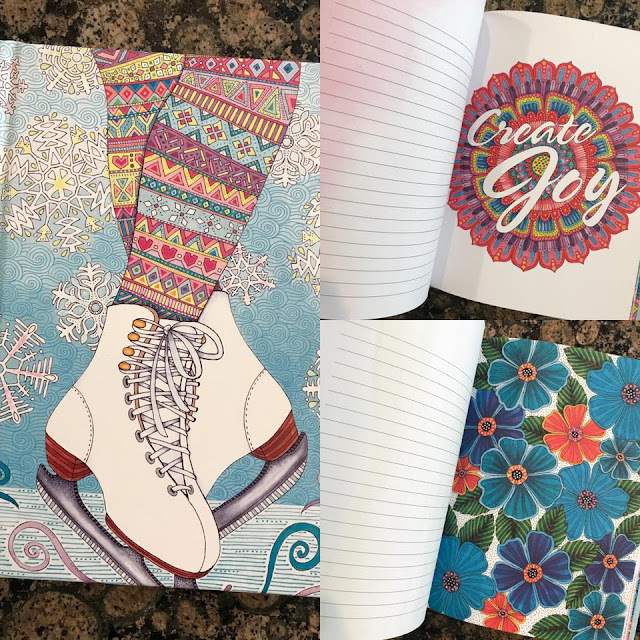 Pictured above, "Hello Angel Lined Journal Skates" journal. My oldest daughter, who spent a few years "on the ice" is going to absolutely love this journal. Not just because it's got a pair of skates on the front (though that will help), but because she's fourteen and needs a safe space to write her feelings down on paper. There is plenty of space to write, as well as colorful, bright illustrations to also encourage some inspiration. This is a journal for her to freely right her feelings out, with no prompting from the pages of the journal. 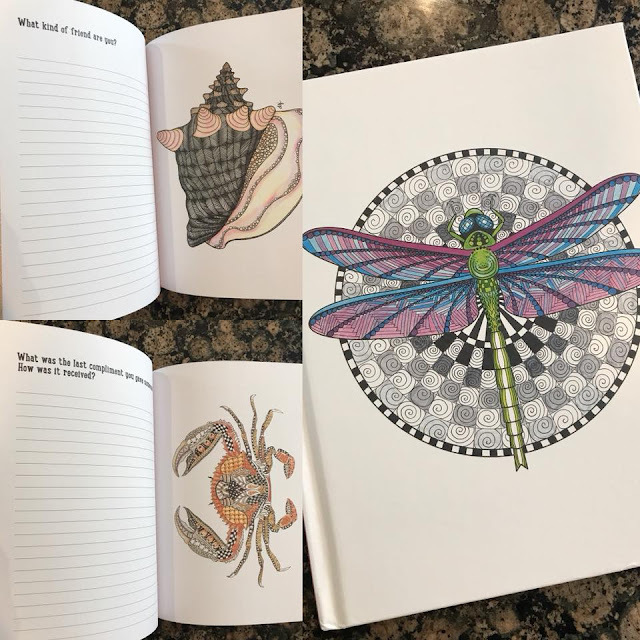 Pictured above, "TangleEasy Guided Journal Dragonfly". Pictured above, "Woodstock Dot Peace, Love, Music" journal. This journal starts out with several prompts or ideas for journaling in the first few pages. The entire inside of the book, aside from those pages are simply covered in light grey dots, giving you space to draw, doodle, write, calendar, set goals, etc. Whatever your heart desires. It also has an elastic band to put over it, in case you tuck papers, concert tickets, mementos, etc. so they stay in the journal with it. All four of these journals are made to last years (mine have survived from high school) and can definitely become keepsakes to be passed on to generations to come. Journaling is a great way for one generation to connect with another...since "talking" is become outdated. I love that this is something NOT DIGITAL, Creative and offers a healthy way to vent, express and just be! 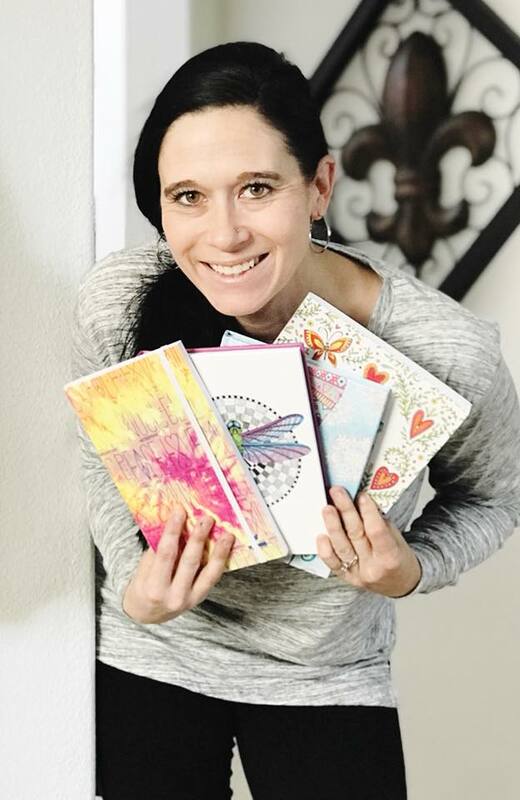 CLICK HERE to check out their entire line of journals! 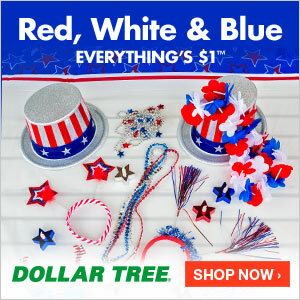 They offer more than just journals too...you may be amazed!! I was not paid to feature this post! I was compensated only by the products that were sent for this review/feature!